When social communication becomes synonymous with team building! On April 14, at the Global Meeting Industry Day, AIM Group International put together a social media marathon to celebrate the first international day dedicated to the meetings industry. 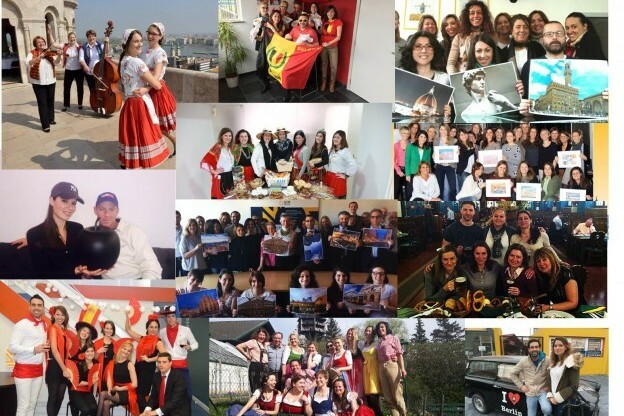 Every hour a different international office of the Group posted a picture on Twitter representing their team. All the colleagues at the various European locations and in the United States decided to celebrate together by sharing photographs that characterised their destination. Featured were scenes from the Big Apple (New York City), the Tyrolean "Dirndl and Lederhosen" of Vienna, the folkloric traditions of Budapest, the monuments of Italy, the colours of the Belgian soccer team, the flamenco of Spain, the culinary specialties of Prague and Lisbon, and the Germany traditional cars. We created a playful day full of fun and produced moments of cohesion among the offices which provided an important team building experience. From nine in the morning until six o’clock in the evening, the posts with photographs of our different destinations created a "viral" effect amongst the various associations in the Meeting Industry: ICCA, MPI, SITE, IAPCO and many convention bureaus followed with interest the unfolding of AIM Group International’s virtual team building experience. Piero Loredan, Communication & Social Manager of AIM Group International, summarised the day. "It all started with goals to participate in GMID (Global Meetings Industry Day), to support the importance of the meetings industry globally and to spread the key concept that AIM Group International is a truly global company. We developed this innovative idea the Team Building 2.0. People today, through the sharing of messages and pictures on social networks, communicate and gather in different ways. We wanted show how people in AIM Group International create and share, allowing everyone to participate and how, by breaking down geographical distances, differences of roles and age, we are able to increase the sense of belonging to the company. According to the analytics data of our Twitter account, the level of engagement (a measure that takes into account the number of "likes", "retweets" and "Twitter reach") was increased by over 600% compared to the usual daily average – all on this in a single special day!" This was the first AIM Social Media Day but it won’t be our last as we are working to design other #AIMazing events. Click here to view the history of AIM Social Media Day on Twitter!